Boeing is working through cascading supplier problems that will hamper third-quarter deliveries of its 737 jetliner, the plane maker’s largest source of profit. Boeing now expects to deliver fewer of the 737s than it makes during the third quarter, before accelerating shipments by the end of the year, Chief Financial Officer Greg Smith said Wednesday. The company is working to streamline production at its single-aisle plant while also investing to help suppliers tackle bottlenecks. The planemaker’s shares dipped 0.8 percent to $348.04 at 1:42 p.m. in New York. Among the supplier glitches confronting Boeing are airframes shipped hours late or out-of-sequence by Spirit AeroSystems Holdings Inc.. A propulsion joint venture of General Electric Co. and France’s Safran SA, has also fallen a few weeks behind schedule in its Leap engine shipments to both planemakers. Airbus SE parked about 80 of its popular A320neo family -- down from a peak of 100 jetliners -- as it awaited delayed engines from Pratt & Whitney. At least 40 unfinished aircraft are parked around Boeing’s facility and an adjacent air strip as mechanics scramble to install parts that arrived late or out-of-sequence, the Seattle Times reported last week. 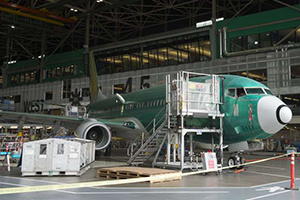 All told, Boeing has about $1.8 billion of 737 inventory sitting on the tarmac at Renton, Ron Epstein, an analyst with Bank of America Merrill Lynch, said in an Aug. 6 report. With the 737 Max and A320neo family jets largely sold out through 2024, Boeing and Airbus are contemplating another set of production step-ups next decade. While the European planemaker has publicly discussed boosting output to a 70-jet or even 75-jet pace, Boeing has been more cautious. The Chicago-based planemaker is studying the capital investment, tooling and supplier hurdles it would need for future rate hikes -- as well as how long the higher output could be sustained, Smith said.